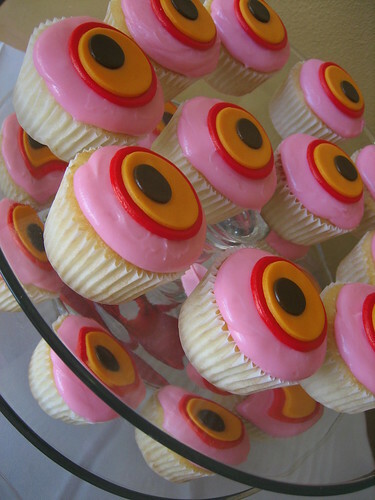 I had the pleasure of getting some cupcakes from Miami's Cupcakes Nouveau delivered to me last weekend. (See our interview with the owners here.) I'll do a full Miami cupcake report this weekend (I tried them from 3 places) but the ones I had from them were very good. I had wanted to try their guava-filled ones but discovered I'm probably not as much of a guava-lover as I liked, but the consistency and way it was filled was delicious. The other one I tried was chocolate cake with some kind of yummy cream inside; there were two more but they got eaten! My 4 cupcakes were resting on a bed of mini marshmallows in a round tin (photo coming soon) and were all so beautiful I almost didn't want to eat them and mar their loveliness. This cupcake order consisted of Vanilla Elegance (Madagascar Vanilla Bean cupcakes with a Swiss Meringue Frosting) and Chocolate Chic cupcakes (Chocolate cupcakes with a creamy chocolate center, topped with a French Vanilla Buttercream Frosting). The party was for a girl going away to medical school in St. Barts. 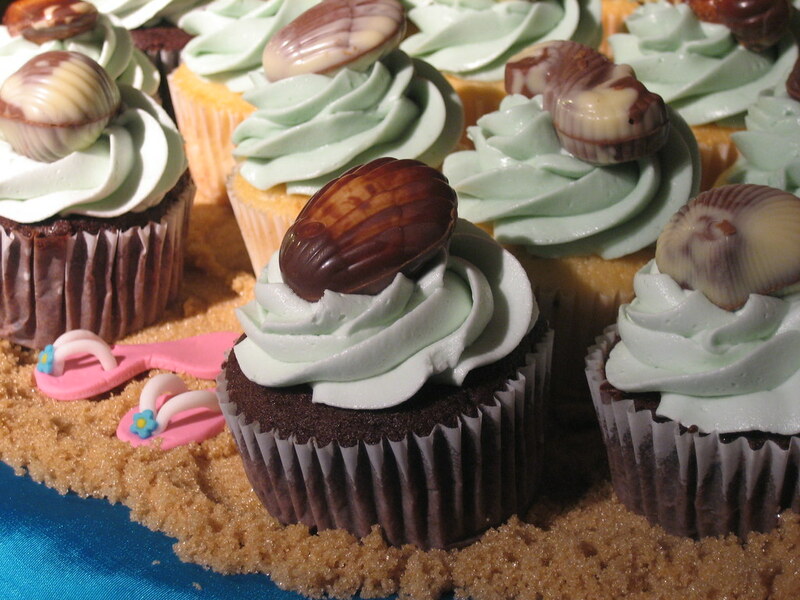 The cupcakes were decorated with seashell chocolates, displayed on a bed of brown sugar "sand", on top of a blue "ocean" fabric, with fondant flip-flops. (Key Lime cupcakes with a Meringue Frosting) , Autumn Spice Carrot Cupcakes (Carrot cake cupcake infused with Cinnamon and Nutmeg, topped with a Cream Cheese Frosting), and Romeo & Juliet cupcakes (Guava filled cupcakes with a hint of almond, topped with a Cream Cheese Frosting). 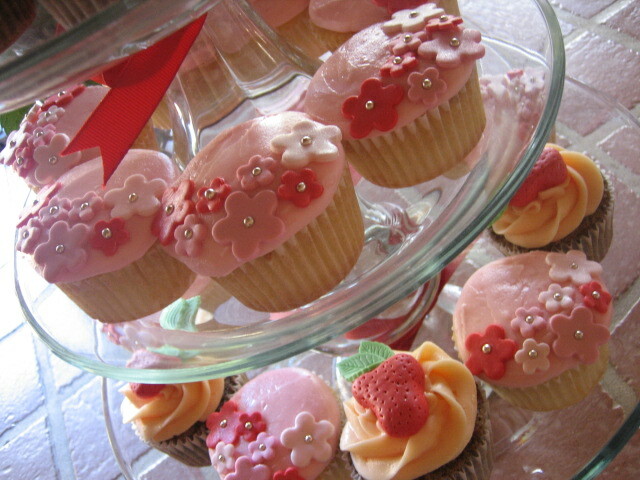 The cupcakes were designed to match the bridal shower invitation. Chocolat Chic cupcakes (Chocolate cupcakes with a creamy chocolate center, topped with a French Vanilla Buttercream Frosting) and Romeo & Juliet cupcakes (Guava filled cupcakes with a hint of almond, topped with a Cream Cheese Frosting) designed for a Strawberry Shortcake birthday party. 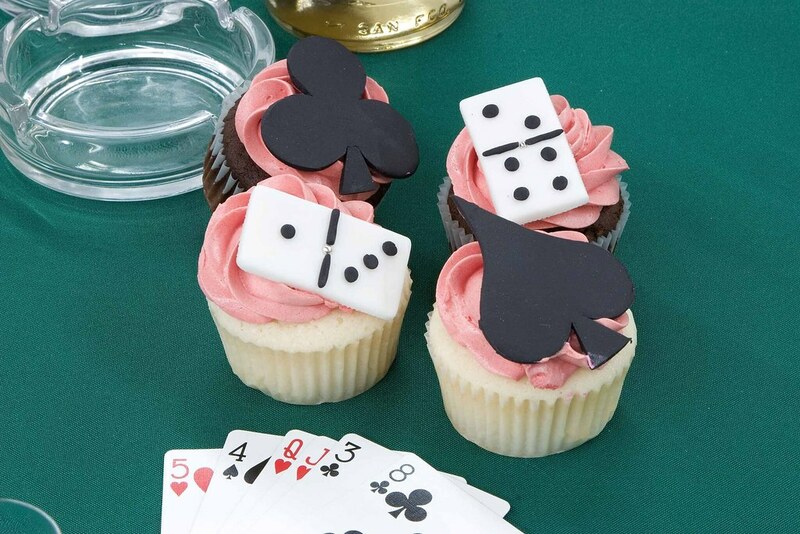 Domino and Card Suit Cupcakes for a game themed cocktail party consisting of Vanilla Elegance (Madagascar Vanilla Bean cupcakes with a Swiss Meringue Frosting) and Chocolate Chic cupcakes (Chocolate cupcakes with a creamy chocolate center, topped with a French Vanilla Buttercream Frosting). 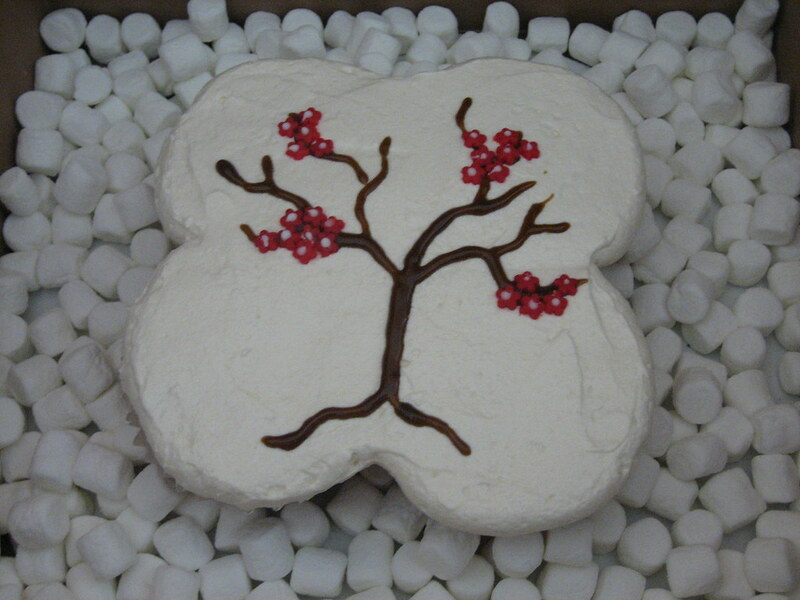 A Cherry Blossom Pull-Apart Cupcake Cake with four clusters of blossoms representing four members of a family. A Paint Ball cupcake pull-apart cake! Lucas and Lorenzo's Paintball Pull-Apart Cupcake Cake consisted of Vanilla Elegance (Madagascar Vanilla Bean cupcakes with a Swiss Meringue Frosting) and Chocolate Chic (Chocolate cupcakes with a creamy chocolate center, topped with a French Vanilla Buttercream Frosting). 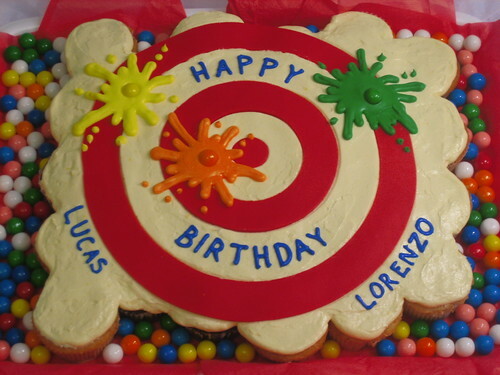 Fondant was used for the bullseye and gumballs were used as the paintballs. I had some of these "couture cupcakes" they were not all that. The meringue was watered down, and the cupcake itself was dry. I had to chew more than 28 times to get through this treat. Sorry its a definite Negative for me! I would take an anonymous posting as very suspicious. We recently did a tasting and of the 9 different cupcakers we sampled, theirs stood out with the top 3. Seems to me a bitter fellow cupcaker that cannot let a fellow cupacker share the spotight. not sure where the first poster got their cupcakes from but it certainly was not from here. i cant wait for these two to get a store front i adore their cupcakes.